For other uses, see Finch (disambiguation). The true finches are small to medium-sized passerine birds in the family Fringillidae. 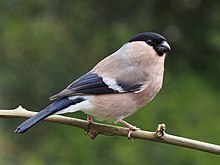 Finches have stout conical bills adapted for eating seeds and often have colourful plumage. They occupy a great range of habitats where they are usually resident and do not migrate. They have a worldwide distribution except for Australia and the polar regions. The family includes species known as siskins, canaries, redpolls, serins, grosbeaks and euphonias. Many birds in other families are also commonly called "finches". These groups include: the estrildid finches (Estrildidae) of the Old World tropics and Australia; some members of the Old World bunting family (Emberizidae) and the American sparrow family (Passerellidae); and the Darwin's finches of the Galapagos islands, now considered members of the tanager family (Thraupidae). Finches and canaries were used in the UK, Canada and USA in the coal mining industry, to detect carbon monoxide from the eighteenth to twentieth century. This practice ceased in the UK in 1986. Limits of the genera and relationships among the species are less understood – and subject to more controversy – in the carduelines than in any other species of passerines, with the possible exception of the estrildines [waxbills]. Beginning in around 1990 a series of phylogenetic studies based on mitochondrial and nuclear DNA sequences resulted in substantial revisions being made to the taxonomy. Several groups of birds that had previously been assigned to other families were found to be related to the finches. The Neotropical Euphonia and the Chlorophonia were formerly placed in the tanager family Thraupidae due to their similar appearance but analysis of mitochondrial DNA sequences revealed that both genera were more closely related to the finches. They are now placed in a separate subfamily Euphoniinae within the Fringillidae. The Hawaiian honeycreepers were at one time placed in their own family, Drepanididae but were found to be closely related to the Carpodacus rosefinches and are now placed within the Carduelinae subfamily. The three largest genera, Carpodacus, Carduelis and Serinus were found to be polyphyletic. Each was split into monophyletic genera. The American rosefinches were moved from Carpodacus to Haemorhous. Carduelis was split by moving the greenfinches to Chloris and a large clade into Spinus leaving just three species in the original genus. Thirty seven species were moved from Serinus to Crithagra leaving eight species in the original genus. Today the family Fringillidae is divided into three subfamilies, the Fringillinae containing a single genus with the chaffinches, the Carduelinae containing 183 species divided into 49 genera, and the Euphoniinae containing the Euphonia and the Chlorophonia. Although Przewalski's "rosefinch" (Urocynchramus pylzowi) has ten primary flight feathers rather than the nine primaries of other finches, it was sometimes classified in the Carduelinae. It is now assigned to a distinct family, Urocynchramidae, monotypic as to genus and species, and with no particularly close relatives among the Passeroidea. Cladogram based on the analysis by Zuccon and colleagues published in 2012. The rosefinches genus Carpodacus is expanded to include the common rosefinch as suggested by Tietze and colleagues and adopted by the International Ornithological Committee. Fossil remains of true finches are rare, and those that are known can mostly be assigned to extant genera at least. Like the other Passeroidea families, the true finches seem to be of roughly Middle Miocene origin, around 20 to 10 million years ago (Ma). An unidentifable finch fossil from the Messinian age, around 12 to 7.3 million years ago (Ma) during the Late Miocene subepoch, has been found at Polgárdi in Hungary. 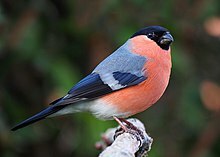 The scientific name Fringillidae comes from the Latin word fringilla for the common chaffinch (Fringilla coelebs), a member of the family which is common in Europe. The name was coined by the English zoologist William Elford Leach in a guide to the contents of the British Museum published in 1820. The smallest "classical" true finches are the Andean siskin (Spinus spinescens) at as little as 9.5 cm (3.8 in) and the lesser goldfinch (Spinus psaltria) at as little as 8 g (0.28 oz). The largest species is probably the collared grosbeak (Mycerobas affinis) at up to 24 cm (9.4 in) and 83 g (2.9 oz), although larger lengths, to 25.5 cm (10.0 in) in the pine grosbeak (Pinicola enucleator), and weights, to 86.1 g (3.04 oz) in the evening grosbeak (Hesperiphona vespertinus), have been recorded in species which are slightly smaller on average. They typically have strong, stubby beaks, which in some species can be quite large; however, Hawaiian honeycreepers are famous for the wide range of bill shapes and sizes brought about by adaptive radiation. All true finches have 9 primary remiges and 12 rectrices. The basic plumage colour is brownish, sometimes greenish; many have considerable amounts of black, while white plumage is generally absent except as wing-bars or other signalling marks. Bright yellow and red carotenoid pigments are commonplace in this family, and thus blue structural colours are rather rare, as the yellow pigments turn the blue color into green. Many, but by no means all true finches have strong sexual dichromatism, the females typically lacking the bright carotenoid markings of males. The finches have a near-global distribution, being found across the Americas, Eurasia and Africa, as well as some island groups such as the Hawaiian islands. They are absent from Australasia, Antarctica, the Southern Pacific and the islands of the Indian Ocean, although some European species have been widely introduced in Australia and New Zealand. Finches are typically inhabitants of well-wooded areas, but some can be found on mountains or even in deserts. The finches are primarily granivorous, but euphoniines include considerable amounts of arthropods and berries in their diet, and Hawaiian honeycreepers evolved to utilize a wide range of food sources, including nectar. The diet of Fringillidae nestlings includes a varying amount of small arthropods. True finches have a bouncing flight like most small passerines, alternating bouts of flapping with gliding on closed wings. Most sing well and several are commonly seen cagebirds; foremost among these is the domesticated canary (Serinus canaria domestica). The nests are basket-shaped and usually built in trees, more rarely in bushes, between rocks or on similar substrate. The family Fringillidae contains 228 species divided into 50 genera and three subfamilies. The subfamily Carduelinae includes 18 extinct Hawaiian honeycreepers and the extinct Bonin grosbeak. See List of Fringillidae species for further details. ^ Eschener, Kat (30 December 2016). "The Story of the Real Canary in the Coal Mine". Smithsonian. Retrieved 11 June 2018. ^ a b c d e Zuccon, Dario; Prŷs-Jones, Robert; Rasmussen, Pamela C.; Ericson, Per G.P. (February 2012). "The phylogenetic relationships and generic limits of finches (Fringillidae)" (PDF). Molecular Phylogenetics and Evolution. 62 (2): 581–596. doi:10.1016/j.ympev.2011.10.002. PMID 22023825. Archived (PDF) from the original on 2015-06-10. ^ Paynter, Raymond A. Jnr., ed. (1968). Check-list of birds of the world, Volume 14. Cambridge, Massachusetts: Museum of Comparative Zoology. p. 207. Archived from the original on 2015-07-15. ^ Banks, Richard C.; Cicero, Carla; Dunn, Jon L.; Kratter, Andrew W.; Rasmussen, Pamela C.; Remsen, J.V. Jr.; Rising, James D.; Stotz, Douglas F. (2003). "Forty-fourth supplement to the American Ornithologists' Union Check-List of North American Birds". The Auk. 120 (3): 923–931. doi:10.1642/0004-8038(2003)120[0923:FSTTAO]2.0.CO;2. ^ a b c d e Gill, Frank; Donsker, David (eds.). "Finches, euphonias". World Bird List Version 5.3. International Ornithologists' Union. Archived from the original on 26 June 2015. Retrieved 23 July 2015. ^ Arnaiz-Villena, A.; Guillén,, J.; Ruiz-del-Valle, V.; Lowy, E.; Zamora, J.; Varela, P.; Stefani, D.; Allende, L.M. (July 2001). "Phylogeography of crossbills, bullfinches, grosbeaks, and rosefinches". Cellular and Molecular Life Sciences. 58 (8): 1159–1166. doi:10.1007/PL00000930. PMID 11529508. ^ Nguembock, B.; Fjeldså, J.; Couloux, A.; Pasquet, E. (May 2009). "Molecular phylogeny of Carduelinae (Aves, Passeriformes, Fringillidae) proves polyphyletic origin of the genera Serinus and Carduelis and suggests redefined generic limits". Molecular Phylogenetics and Evolution. 51 (2): 169–181. doi:10.1016/j.ympev.2008.10.022. PMID 19027082. ^ Groth, J. (July 2000). "Molecular evidence for the systematic position of Urocynchramus pylzowi". The Auk. 117 (3): 787–792. doi:10.1642/0004-8038(2000)117[0787:MEFTSP]2.0.CO;2. JSTOR 4089604. Archived from the original on 2014-02-25. ^ Tietze, D.T. ; Päckert, M.; Martens, J.; Lehmann, H.; Sun, Y.-H. (September 2013). "Complete phylogeny and historical biogeography of true rosefinches (Aves: Carpodacus)". Zoological Journal of the Linnean Society. 169: 215–234. doi:10.1111/zoj.12057. ^ Zamora, Jorge; Lowy, E.; Ruiz-del-Valle, V.; Moscoso, J.; Serrano-Vela, J. I.; Rivero-de-Aguilar, J.; Arnaiz-Villena, A. (July 2006). "Rhodopechys obsoleta (desert finch): a pale ancestor of greenfinches according to molecular phylogeny". J Ornithol. 147: 448–56. doi:10.1007/s10336-005-0036-2. Archived from the original on 2013-07-03. ^ Arnaiz-Villena, A.; Gómez-Prieto, P.; Ruiz-de-Valle, V. (2009). "Phylogeography of finches and sparrows". Animal Genetics. Nova Science Publishers. ISBN 978-1-60741-844-3. Archived from the original on 2012-09-02. ^ Bock, Walter J. (1994). History and nomenclature of avian family-group names. Bulletin of the American Museum of Natural History Issue 222. pp. 156, 245. ^ Leach, William Elford (1820). "Eleventh Room". Synopsis of the Contents of the British Museum (17th ed.). London: British Museum. pp. 65–70. OCLC 6213801. The name of the author is not specified in the document. ^ Finches and Sparrows by Peter Clement. Princeton University Press (1999). ISBN 978-0691048789. Hír, János; Kókay, József; Venczel, Márton; Gál, Erika; Kessler, Eugén (2001). "Elõzetes beszámoló a felsõtárkányi "Güdör-kert" n. õslénytani lelõhelykomplex újravizsgálatáról [A preliminary report on the revised investigation of the paleontological locality-complex "Güdör-kert" at Felsõtárkány, Northern Hungary]". Folia Historico Naturalia Musei Matraensis (in Hungarian). 25: 41–64. Jønsson, Knud A.; Fjeldså, Jon (2006). "A phylogenetic supertree of oscine passerine birds (Aves: Passeri)". Zool. Scripta. 35 (2): 149–186. doi:10.1111/j.1463-6409.2006.00221.x. Marten, Jill A.; Johnson, Ned K. (1986). "Genetic relationships of North American cardueline finches" (PDF). Condor. 88 (4): 409–420. doi:10.2307/1368266. Wikisource has the text of the 1911 Encyclopædia Britannica article Finch. National Finch and Softbill Society website — organization promoting finch breeding. "Finch" . The New Student's Reference Work . 1914. Wikimedia Commons has media related to Fringillidae.